Southbound Class M-1 freight motor No. 1217 rumbles around a curve past the Texaco refinery at Burnham, NY with a through freight on its way to New Haven. The loco’s chassis is scratchbuilt. Lead trucks are O scale Bill Clouser traction parts; pantographs are old Walthers O scale “short”; the superstructure is spliced from two American Flyer Reading cabooses. Windows are Grandt Line On3 D&RG caboose windows. Adjacent to the Port Hudson float yard, a fishing boat waits for the Scherzer rolling lift bridge to open. In the right rear, one can just make out little boxcab diesel No. 1000 switching cars on the float apron. Behind No. 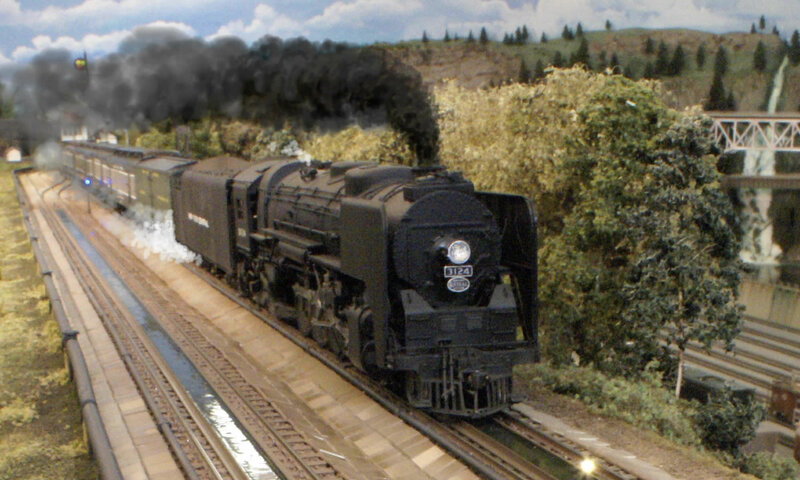 1000 is Port Hudson Express, kitbashed from a Grand River Models “Prince Edward Express” kit. The boat is a Lindberg kit; the corner store is an HO kit with S scale doors. Bob Christopherson scratchbuilt the New England Coal Co. silos. No. 1000’s carbody is a Great American Locomotion kit perched atop a variable-length chassis kit from Pennsylvania Heritage Models. A passenger local chugs past the North Cornwall warehouse district. The camelback ten-wheeler is kitbashed from a brass Omnicon chassis and tender with a heavily modified and detailed American Flyer Atlantic locomotive superstructure. The cab is scratchbuilt of brass. Crossing signal is from NJ International. The watchman, an Arttista figure, stands in front of a shanty by Mullet River Models. The milk platform is a really ancient Mini-Structures kit. The left-hand background building was bashed from a Pine Canyon “Back Alley No. 2” kit. The warehouse on the far right is constructed from O scale Design Preservation modules.